Bellator MMA was able to move the needle last week with the signing of former UFC lightweight champion Benson Henderson. They attempted to keep the momentum going by announcing the signing of heavyweight Sergei Kharitonov. Any time a promotion other than the UFC can sign a fighter inside the Fight Matrix top 20 it is a victory. However, Bellator still faces an up-hill battle when it comes to competing with the biggest promotion in the history over MMA. Let’s compare the difference from the last Fight Matrix ranking to come out before the signing of Henderson and Kharitonov (1/31/2016) to the one published roughly one year previous (2/1/2015). Bellator is being more proactive than ever when it comes to competing for top talent. However, the game is certainly rigged against them. Henderson and Phil Davis both appeared to be fighters that the UFC was willing to lose. Otherwise, there could have been an extended contractual matching situation. Scott Coker has also done his best to drum up interest without using ranked fighters. The promotion’s upcoming Bellator 149 event features a pair of main events, Ken Shamrock vs. Royce Gracie and Kimbo Slice vs. Dada 5000, without a single ranked fighter. It is hard to look at events like Bellator 149 and not think that Strikeforce cards were loaded with more talent. It is true that the UFC’s hold on talent was not as strong back in the day. There is also another interesting reason. 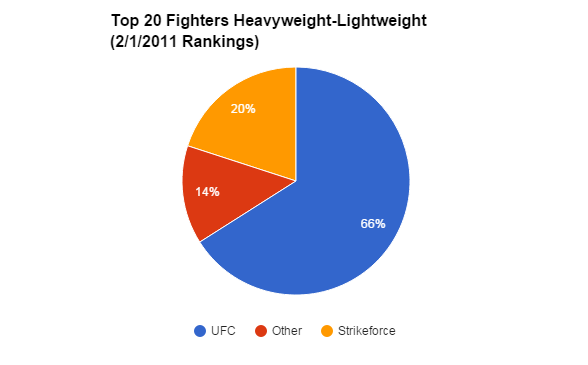 If we look at rankings from a similar week (2/1/2011) during the final year of Strikeforce, we can see that Strikeforce actually only had 20 fighters ranked in the top 20 of their divisions. However, Strikeforce did not sponsor champions in any division lower than lightweight. 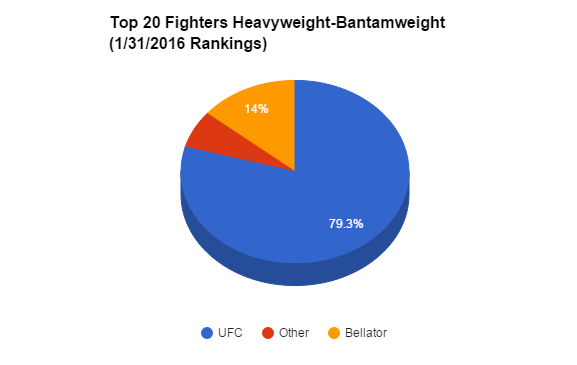 If we look at the percentage of top-20 fighters in heavyweight to lightweight divisions, the percentage of top Strikeforce talent is higher in those divisions. 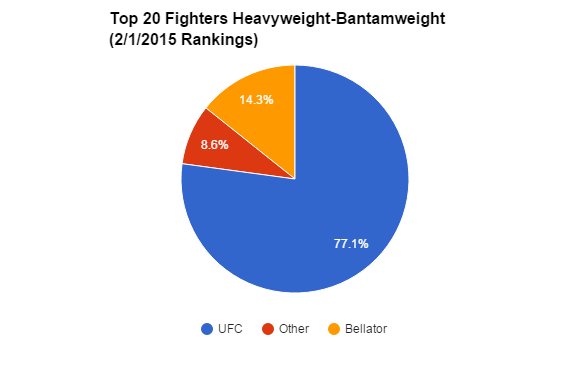 It would be ridiculous for Bellator to drop their sub-lightweight divisions. Afterall, some of their best fighters like Daniel Straus, Patricio Freire, Eduardo Dantas and Marcos Galvao compete there. With that being said, sponsoring champions in seven different weight classes makes the need for top talent that much stronger.